Home » Philippines » Pinoy brain » Pinoy Trivia » tattoe » Term used to refer of tattooed indigenous people in the Philippines? » Term used to refer of tattooed indigenous people in the Philippines? Term used to refer of tattooed indigenous people in the Philippines? 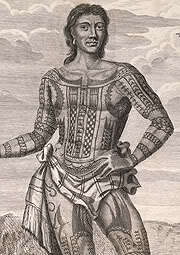 Term used by Spanish colonists to describe the tattooed indigenous Cebuano Visayan people.They were found on the islands of Cebu, Bohol, eastern part of Negros, Samar and Leyte in the Biçayas (Visayas) region of the Philippines.The word itself means "painted," and was first used during the Spanish colonization of the Philippines.The men are known for their tattoo art, which often covers most of their bodies. They apply the tattoos by pricking the skin with sharp pieces of iron and then applying black powder to the open wounds which is absorbed into the skin permanently. The inhabitants of the province of Camarines, located at the eastern end of the islands, resemble the Pintados. Writing in 1565, in describing the natives, Rodriguez says: "... these Indians wear gold earrings, and the chiefs wear two clasps about the feet. All the body, legs, and arms are painted; and he who is bravest is painted most." This tradition has been developed by the Pintados Foundation, Inc. in 1986. It oversees the first Pintados Festival in 1987 in Leyte. It is celebrated every June in Tacloban City as a memorial to the colorful and rich history and culture of the Leyte and Samar provinces. Some of the key parts of the festival are the "Fun Festival of Festivals," "Ritual Dance," and "Pagaranhak" Grand Parade. Every Pintaya Festival, the streets are filled with dancers to paint the body like the Pintados.